This morning, while fixing breakfast in our apartment, I heard a gondolier singing, not an unusual occurrence in Venice, but his voice sounded like it was in the next room. 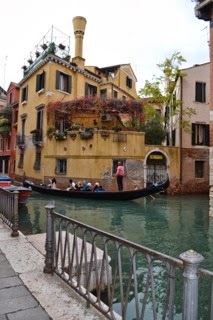 I pulled back the curtains and shutters, and a gondolier was within arm’s reach, his face even with mine. All of a sudden there were gondoliers zipping back and forth in the canal beside our apartment, not their usual route, but it seems the water had risen and the gondoliers had changed their route. A young Japanese gentleman’s face, raised up at the crumbling buildings, noted my presence. His face broke into a wide smile and he waved at me. I returned the wave and all three of the young Japanese couples in his boat waved. Like small children, their hands flicked back and forth rapidly, and their smiles were so wide they might have been attempting to escape their faces. I broadened my smile and waved back, and they waved all the more. My smile was, I hope, welcoming, but it arose out of my knowledge that they had mistaken me for an Italian resident when I also am a tourist. It was almost as much fun as hearing music, somewhat organ-like, coming from outside the internet shop. As it came closer, I peeked out the window and saw three alpenhorns stretched the length of a gondola with three alpenhorn players making extraordinary sounds, the music of mountain heights reverberating over the water and bouncing off ancient palazzos. Aside from needing my Venice fix, to satisfy my addiction to the aging buildings lacing the canals, my primary purpose in going to Venice for the fourth time was to do research. I am working on a book about Elena Piscopia who, in 1678, became the first woman in the world to earn a university degree. We (Gary and I) spent a significant amount of time in libraries, and some wandering the streets for the ambience, but the city itself I had exhausted previously. No, that is incorrect! You can never exhaust Venice. with electric outlets), walk across the creaky floors to the card catalogs or computers, and sit among scholars in total silence, thumbing through materials both modern and antique. The principal difference between their libraries and ours seems to be the purpose of the library. 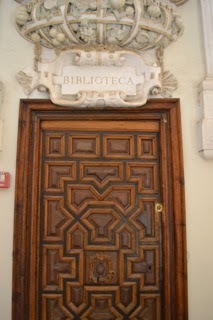 The libraries in Italy seem to be designed for the books. They are cool, requiring sweaters on even warm days. Many of the best materials are locked away and require an expert to locate them. They are focused largely on their own national navel and some of the librarians resent that I do not speak Italian fluently. They refuse to speak slowly enough for me to understand them. Fortunately, there are librarians in other libraries who go out of their way to assist and graciously assure that we find what we seek. Just to be safe, however, we never mention that the upshot of this research will be historical fiction. woman portrayed throughout history as a prostitute. The fact is that noblemen could not marry below their station in Venice and Elena’s father, Giovanni Cornaro, loved Zanetta Boni enough to produce five children with her before he was able to persuade the Republic to violate their laws and allow him to marry. There is no evidence that Zanetta was ever with anyone other than Giovanni Cornaro, but the portrayal of her lack of morality persists. Elena was eight years old when her parents were married, probably after the payment of an exorbitant fee. Elena was fluent in Latin, Greek, Hebrew, Spanish, French and Arabic. She studied theology, philosophy and science. 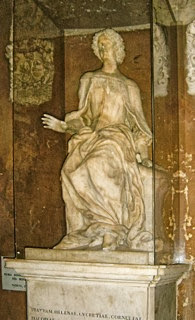 Intellectuals visiting Venice would come to the Cornaro household to hear her recite or dispute on topics. Her father promoted her shamelessly and fought to have her receive a degree in theology from the University of Padua. The Cardinal who headed the University disagreed that a woman could have a degree in theology. A degree meant the recipient could teach and the Cardinal did not believe that women were qualified to teach theology. They are of a lower moral character and more receptive to the heresies of the Reformation, he argued. A compromise was reached and Elena received a degree in philosophy. The next year the University voted to prohibit women from receiving degrees. Elena was also religious, joining the Benedictine order as an oblate. When she died, at the age of thirty-eight, she was celebrated by learned societies as a scholar, virgin, and saint.